and lifestyles thanks to digital products and services. Digital Commerce Academy is your roadmap to building the business of your dreams without squandering time and money, stumbling to find the right path, or making unnecessary mistakes. Join the Digital Commerce Academy waitlist today! 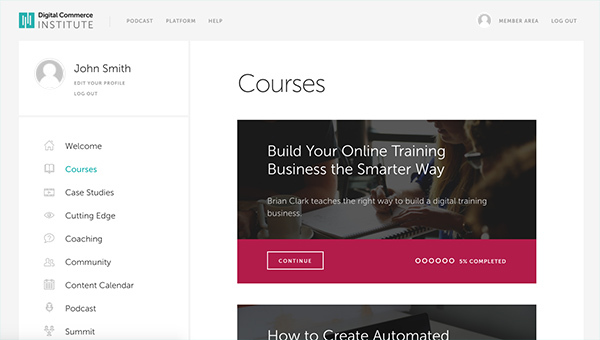 DCA features full-length courses (including Brian Clark's Build Your Online Training Business the Smarter Way), 20+ webinars featuring in-depth case studies and education on cutting edge tools, as well as Q&As with the Rainmaker Digital team. The doors to DCA are currently closed, but we are reopening them in August. Join the waitlist today to get the best price when DCA reopens. Let’s make your digital dreams a reality. We’re Rainmaker Digital, the company behind Copyblogger, StudioPress, the Rainmaker Platform, and now DCI. We’re a bootstrapped digital commerce company that's created and sold tens of millions of dollars in digital products and services, with $12 million in 2015 revenue alone. That said, we’ve also made every mistake in the book on the path to getting it right. So, we not only know what works, we can also help you succeed faster by avoiding expensive missteps and errors that waste your precious time.